Struffoli is the name of one of the most ancient recipes in the rich repertoire of Neapolitan cuisine. The word indicates the tiny balls of deep-fried dough coated in honey and decorated with candied fruit and spiced hard-candies that you will find on every pastry shop window in Naples in the weeks around Christmas and New Years Eve. If you have an idea of the millennial multilayered history of the city of Naples, in Southern Italy, it would come as no surprise to you that the most typical Christmas recipe on Neapolitan tables is, in fact, the result of a Mediterranean contamination. The word struffoli seems to be related to the old Greek stròngylos, or the modern Greek στρογγυλό (strongyló), which means “round”. The Greeks apparently brought this sweet of Middle-Eastern influence over two thousand years ago, when they founded their colonies in Southern Italy. Slightly different variations of the same sweet can be found across the South of Italy, with different names (among them, cicirata in Calabria and cicerchiata in Umbria highlight the resemblance of the pieces of dough with wild chickpeas, cicerchie). The Neapolitan struffoli appeared in the earliest local cookbooks, since the XVII century, and, like many other labour-intensive recipes, were preserved and passed down in convents. In old times Neapolitan nuns would bake large amounts of struffoli and gift them to the most charitable families in the city for Christmas. The association of this middle-eastern-tasting treat with the Christian festivity is probably due to this old custom. The composition of struffoli, and particularly their preserving honey coating, allows them to keep fresh and fragrant for at least one week. Neapolitan households produce large amounts of them right before Christmas and consume them throughout the holiday season, through New Year’s Eve and till Epiphany. 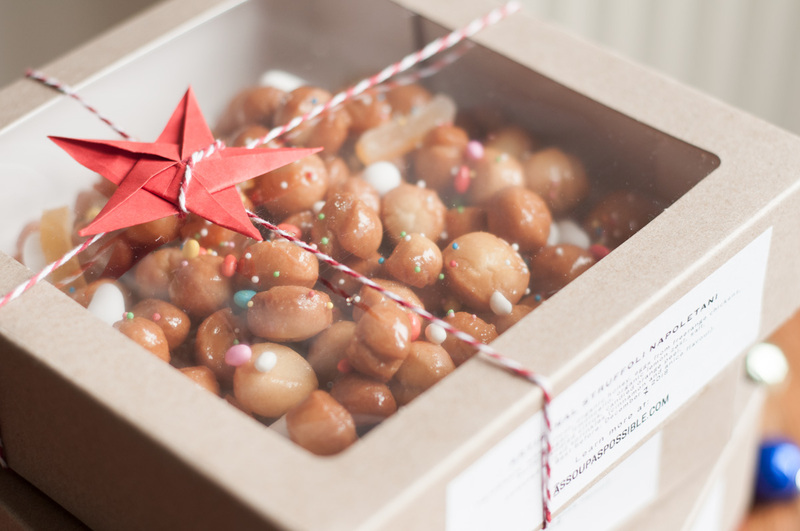 In the most productive families, trays of struffoli are gifted to friends, relatives, and neighbours. Home cooks like to give their personal twist to their batch: you will find households that take pride in their struffoli being really tiny, others adding orange zest to the decoration and flavouring. Some like them softer and add a bit of baking soda to the dough mix, others claim the real struffoli are crunchy. What you find below is my adaptation from my grandmother’s recipe, where anicini (anise sprinkles), cannellini (white cinnamon hard candy), and diavolilli (literally “little devils”, coloured sprinkles) are distinctive and flavourful highlights. While the oldest version of the recipe includes sugna, pork fat, nowadays people prefer using butter instead, and some replace it with vegetable fats, particularly if someone in the family is lactose-intolerant. I use good quality butter, in a reasonable amount. I won’t lie to you: this, like other Christmas sweets, is a high-calory dish, and there’s no way you are going to sell it to healthy-food evangelists at your Christmas table. However, a reasonable serving of struffoli should be small and fit in a coffee saucer. As for many things, it’s a matter of sobriety… Not a very common quality around the Christmas table, I know. Many people struggle to resist the luring second serving of crunchy little honey pearls. We’ll see what your resistance is. Anyway, don’t shoot the messenger, when you weigh yourselves in January! I’m just the one who shared the recipe! Sift the flour and make a volcano shape out of it. Place eggs, egg yolks, butter (softened at room temperature), sugar, liquor, lemon zest, and salt in the middle. Quickly mix everything and knead it into a smooth dough. Let it rest under an upside-down bowl or wrapped in cling film (think twice before you use unnecessary plastic, please) or waxed paper, for about 30 minutes. Heat up the peanut oil in a deep-frying pan, until it reaches 170-180°C (about 340°F). Start frying the struffoli in small batches and drain them accurately on absorbent paper. Make sure that the temperature doesn’t exceed 180°C all through the deep-frying phase. Once you have fried all the dough, take a large saucepan and pour the honey in it. Add one or two tablespoons of sugar and two of water, mix and heat the mix on low heat until it is golden and the sugar is completely melted. You can replace the water with orange or mandarine juice for extra flavour. Remove the pan from the fire and pour the struffoli in, stirring gently until the honey mix is still warm. Add candied fruit, anicini, and cannellini to taste. Keep stirring until the dough pebbles are evenly coated in honey. Pour the struffoli on a serving plate and arrange them with your wet hands. The water will prevent them from sticking. Garnish with more candied fruit, hard candies and sprinkles to taste. Some people place an upside-down glass in the middle of a round plate and arrange the struffoli around it in a ring shape, which makes it a bit easier to scoop the struffoli when you have to serve them. Others like to create a mound of struffoli. Feel free to play around with shapes and decorations. Keep the plate covered in a cool dry place, but not in the fridge. A small plate of struffoli is perfect to end a meal, or with your afternoon coffee or tea, especially if you have guests. Children will love them. Don’t forget to leave some for Santa, and enjoy! This year I’m sharing my struffoli production with some of my readers in Amsterdam. A limited number of boxes per week can be reserved or purchased online and picked up at two friend businesses in the Jordaan. For further info, check out the Facebook event or go straight to my webshop. Previous PostOf Microbes, Pandoro and Love.